American actor, best known for starring in TV series Dexter and Six Feet Under. He looks a little under 5'10'' to me. 5'10'' flat is the highest I can see him, but nothing more than that. Yeah, the first 4 seasons of Dexter were great and he really does consistently look a pretty honest 5'10" without thick shoes. It's clear he's taller than James Remar, whom Rob estimated 5'9" in person even after Dexter ended. Good photo with Marc, he looks about an inch taller, but looks to have around half an inch less footwear. Oh this guy? Surprise mother****er. 5'10 or 178 cm tall. He's 4 cm taller than his ex wife leann carp. Wish they were together again for forever.Dexter series, the good old times. That's right it's over. I'm not sure about that...I think he looked a big inch taller than her. 179.5cm wake up, 177.5cm goes to bed. Any 5'10-ish actor measure it is consider quite legit 5'10. Michael could have drop 1/8 more in the evening/night. Yes, there seemed at least 20 pounds difference. He had more meat on his bones when playing Dexter, possibly near 180 is right. Looks EXTREMELY average to me. So 176-178 is a safe bet. Been watching Dexter again and he's at least 2 inches taller than Jennifer Carpenter who's a strong 5'8. He looks identical to both David Zayas and Desmond Harrington who are around 5'11. He doesn't look to have any footwear advantage and has loose posture. 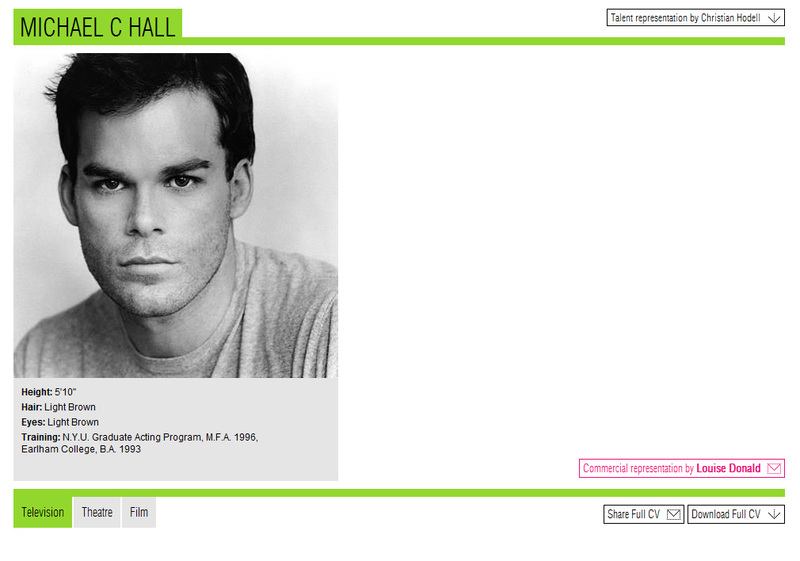 I would argue that Michael C Hall is a strong 5'10. IMDB or some other internet listing has little to do with how tall Michael or any other actor is. Michael's agency listed him 5'10" as Rob posted below. As far as I know, they didn't give a metric height, nor has Michael given one to my knowledge. Obviously 177 cm is possible as well since it's not much different than 177.8, but not because of internet listings that have nothing to do with Michael. I strongly believe he's 176-177 cm. He's even listed 177cm and listed heights are always 99% upgraded! Looks 5'10'' on the nose to me. 5ft 10in is probably for hall correct. In real life actors are taller than what you see on tv. And don't forget that what's given on the list is mostly the real height of actors. Definitley Six Feet Under, as it says in the description. Yeah, thin footwear and a bit of loose posture will make a flat 5'10er look 5'9 range next to other people. Dexter has to be one of the best performances ever. He was scary but still believable as a human being. 178cm. Editor Rob: he never wore thick shoes from what I recall, sometimes even like a 0.5-0.75 inch range...but I would agree, I thought he was great on the series. He looks my height (5'9.5/177) to me. I can't see a full 5'10 at least in Dexter. Rob how tall do you think the actor that plays his brother in dexter is? Roughly??? Editor Rob: he's got a page here, I think a decent 6ft 1er. He looks 177 to me, 2 cm less than Desmond Harrington. What about the actor who played keith david boyfriend. Michael's probably 5'10 flat by lunchtime; you can say the same for Matt Damon too. How tall do you reckon Eric King is? He certainly isn't 5'10", he looks more like a 5'7" guy, although I think he's a lift wearer. Legit 5'10. Holds well against some pretty tall guys who have been on Dexter. i Think he is 1.75 or 1.76 max. All actors says height in shoes, just downgrade 3cm of wich one and the real height. enigma, in literally no country on planet earth is 5'10 "short". 6 feet for a man is only average in less than 5% of countries on planet earth. I looked up Dexters height after seeing him with Jimmy Smits. Smits towers over Dexter and is huge in both height and bulk compared to Dexter. It surprises me how short actors are in America. I suppose it's because being 5.10 and a female and my sons are all over 6.4, 6 feet seems average. It must be the viking stock! I adore Dexter and couldn't care less how tall he is! Thank you rob. And I have another question; How is better to measure your height, pushing your chin low, in your neck so the top of the back of the head will reach the maximum height, or having your chin a little bit higher, so the top of the front of your head will be higher. Personally I saw that if I push my chin lower so the top of the back of my head go higher, I gain 5 mm. Sorry for my english. Thank you again. Rob, I have a question for you. I woke up at 10am and measured mayself after 6 hours(4pm) and my height was 182.7 and then measured myself again at night(2am), after 16 hours of only staying on my chair and on my feet, never lying in my bed, I had 182.2, so 5mm less than in the afternoon. So waht exactly will be my height rob, the second one or the first one? Thank you ! Markus, Zayas is listed 180cm here. A few years ago Jennifer Carpenter was listed everywhere not under 177, but you can clearly see that she's shorter on Showtime's Dexter. Michael seems 176/177 while Desmond looks taller especially next do David Zayas who's 183/184. I can buy 177 for Michael and at least 180 for Desmond. Jennifer instead is probabily 175 top (you can see it especially when she's next to "Masuka" who's not over 164/165 and there's a big difference between the two). Anyhow, I'm still watching Dexter, it is a wonderful show, probabily one of the best ever made. I wish it would continue with a Spin Off. He looks about 2 inches shorter than Desmond Harrington. I'm not sure who has thicker shoes, but he might be 176/177 ish. He's a pretty average man, in my opinion. Rob, has Hall always listed here as 178cm? Rob, how tall do you think David Zayas (aka Angel Batista) is? No way he's 180... Not even sure he's 178. 176/177 would be more accurate. He looks pretty much like a typical 5'10 flat guy the more I see him. I've thought maybe 176-177 cm was possible in the past but I see now that's too low a guess. Seriously you see so many ****ing actors lie about their height, we get it any shorter than 5'10 you are considered short in move land. But come the **** on, it pisses me off seeing so many guys lieing about their height and saying they're 5'10. Matt Damon is a good example of that. I think your comment is incredibly stupid. Who are you? Doctor of the University of Height Judging? I saw him several years ago on stage in Chicago. This is roughly what he seemed to be, neither particularly short nor tall. Argue? This is a celebheights. We are disgussing about heights. some people here even argue about a 1/4 inch. he could be 177 on some days and 178 on other days depending on how long he slept or activities he did. dumb to argue one centimeter. Website can't be published here but that height stands up there and besides it seems to fit for Michael. This was just a one height recommentation among in other requests, and I decided to publish it in here. Of course I don't underestimate you, patriotic people stands there. But we are talking just about height, so what where country you are from. No offense, but why should we care what it says about his height on a Finnish website? Do they know more about him than his countrymen? Finnish website informs he's 5'9.75" or 177 cm. Average height man. 178 cm fits. Click Here MCH is a full 5-10. No doubt. Erik King is like 5-7 and that is probably generous with the thick soled shoes he always wore on the show. Rob, How tall do you think Erik King (Doakes from Dexter) is? He always looked noticeably shorter than Dexter despite being listed at 5'10" (obviously a bogus listing). His bulk probably made him appear shorter, but I have a hard time believing he's taller than 5'8". He doesn't look 5'10" More like 5'9" or 5'9,5" (175-176cm). 100% sure he's no more than that. Looks like he is 1-2 inches shorter than 5' 11" listed Desmond Harrington. Might be 5'9.5" - 5'9.25". Jennifer Carpenter is 5'8'' (gets even listed as 5'8.5'' here). MCH is clearly taller than her in all photos were they both wear flat shoes. Just do the math. He's 5'10''. Hey Rob, i watched all seasons til the season seven in the last months. Hall always looked average tall to me. Some people are taller, some are smaller. I haven´t the impression of a tall or a small michael c hall yet. Do you think hall could possible be 1.76 or 1.75.5 (latet at day) like myself? He looks 5-8 or 5-9 in most everything. Michael is the epitome of "averaged-height man." On Dexter he never looks tall, and never looks short. @HommeVert Maybe about 5'9.5", I met Desmond Harrington (Quinn from Dexter) and was marginally taller than him (I am 5'11" even, max) which woud lead me to believe he is about 5'10.5" - he always appears to have about an inch on Dex. Still, I think 5'10" is fair, he's probably about that in the morning. I think he looks like a shorty on Dexter! I can't believe he's 5'10" -- I bet he's 5'8"
He could be 176 or 177 cm, he's about 2 cm shorter than Desmond Harrington, and I don't believe he's the full 180, more like 178 or 179 cm. I have long legs and i'm only 5 foot 10. Those really tall actors have long legs emily. I think more girls have long legs. He looks about 5 foot 10 but i thought he was closer to 6 foot. jimmy smits has to be bigger than 191cm. He looks 6 foot 4 at least. He is huge. He's all torso? I think his legs are shorter than his torso but isn't that the norm with males? Which male celeb has long legs? I can't think of one. 1) Just glance at Ian Sommerhalder next to Rob. After Rob he is supposed to be 176 and they look like there's no difference on the photo in spite of 1 inch between them. 2) Now, look at "Desmond Harrington" photos supplied by Vayne. He stands next to MCH and then seems to tower him by 2 inches or so if Rob estimate of Ian is correct. MCH really must be in the 175-177 fork. This guy is all torso, looks like a 6' at least before he stands next to someone, then looks much smaller. Definately no less than 5'10", he just has the look of a tall guy. Most of the other males on Dexter are about 6ft+ and he never looks much shorter than them. Click Here 5'10'' spot on, 5'11'' morning height. prob one of the few big time actors who is 5'10'' and doesn't claim 6 feet. He´s no taller than 5´10. I´m a little over 5´11 and he doesn´t look my height whenever i see him on TV. Yeah, pushing 5'11". Jennifer is 5'8" and only towered over him at formal events when she wore block high heels. Remeber season 3, when we see Michael and Jimmy Smits facing on the marina. It was flat and Jimmy had something like a head over Michael. Watch it again. If Smits is 191 cm, Michael cannot be more than 176 or 177 max. there is really no way that he is under 5'9. i've watched all 7 seasons of dexter. He is with Matt Willig who is supposed to be 2 m... Less than 5' 9 possible for him ? Yup 5'10. maybe 5'10.25 but i doubt anymore than that. i think he is 179 cm tall,and he is a great actor!! 5.9 tops. In many shots J. Carpenter is taller than mike. Agree with Tyler on this one.....he's got broad shoulders and a strong upper body which makes anyone look taller than they actually are. So even though he's 5ft 10 he easily passes for 6ft. Never looks anything less than 177cm on Dexter. 178 is perfect, heck that may be even a little modest for him. Five foot 10. He was tall next to 6 foot 4 john lithgow. Accurate listing. Stand n looks it! Rob, I think he's nearing 5'11 flat. He doesn't have the greatest posture at the best of times. But he's got 3 inches on Jennifer Carpenter and at least 4 on Julia Styles. He looks a strong 5'10"....no less. idk, in the equal ground shots and photos I've seen C Hall only has a bit more than an inch on Carpenter. He gave me a 6´1" impression in dexter at times, but when I met him in Boston, he was at least 2.5" shorter than me, I am 6´1.5". 5´10" for sure. yeah exactly. 5ft10 on the dot. Completely average. like the comment about having a stocky build that makes him look a tad shorter, like matt damon. exactly. matt damon is definitely 5 ft 10 but a lot of people at a glance might think he's a stocky 5-9. same with michael hall, who is also an honest 5-10. they are very similar in build. he looks comfortably taller than jennifer carpenter (5'8), like 5'10 and change. But when she's in heels, he is shorter. So definitely 5'10 minimum. I thought he was like 5'11 but when you look closer he's probably 5'9. I'm sure he's between 5'9 to 5'9,5. I saw him 2 or 3 months ago in an spanish tv show ( I mean spain, not latin america ) near a guy of 5'6 nad he looked like to be 8cm taller, not more than 10cm so he must be between 1'75cm and 1'78cm, surly. I saw him in a spanish ( I mean spain ) tv show near a guy of 5'6 and he looked like to be 8 cm taller, not more than 10cm so he must be between 1'76cm and 1'78cm. He can easily hold his own against 6'1 krause in Six Feet Under. I don't think he's any shorter than 5'10, maybe 5'10.5 in Dexter. rob do u watch dexter regularly? do u think theres a chance hes more like 176? Looks 5'10 easily next to Jimmy Smits on Dexter. Smits is very tall so he obviously towers over Hall by at least 5 inches. Isn't he dating Jennifer Carpenter(aka his sister on Dexter)? She's a solid 5'8 1/2 and wears a small heel in the show. Some camera angles she looks taller and some angles he has about 1/2" on her.. can't tell, He definitely towers over Rita (Julie Benz) who is 5'4"ish... I'm again going w/ 5'9"..
On six feet under, he looked about 5'10.5" next to Peter Krause who is around 6'1". No way that Hall is over 5'11". I've seen him on six feet under and dexter, and he looks 5'10" to me. Paperwait, I'd agree! 5ft9ish sounds about right, but there has been a few times where he strangely enough looked 6ft! He's listed as 5'10.5", but sure looks like a dwarf next to Smits at 6'3". Of course, shoes, etc and camera angles play a part. If I had to guess, I'd give him a shade over 5'9" barefoot. I just watched Dexter. He looks quite small next to Jimmy Smits who is listed at 6'3". I think he's maybe 5'9" at most. That's funny. I always thought he looked taller. He has the body of a tall guy. Very fit and proportional--makes him look like a 6 footer/6'1". That's what I thought he was anyways. I trust you though Rob! i tought he was like 5 ft 8 or something!! but maybe he is taller that he looks!! You got that right Dennis in the show he is not much taller than Jaime Murray, maybe he is like 5 ft 7 something. He slouches a lot on occasions it seems. He's maximum 5'9, if you watch the show you can see that he's only slightly taller than Jaime Murray who's supposedly 5'7. I've seen Hall in person from a distance and he looked 5'10"-5'11". Ouch!! lol nice find. I just don't know how to explain how she was taller than him in heels during the t.v. show. Camera angles i guess. Although at this point, i'm not totally convinced ...yet.